Valve has launched a new trading system that allows players to trade Team Fortress 2 items for "unopened" games on Steam. 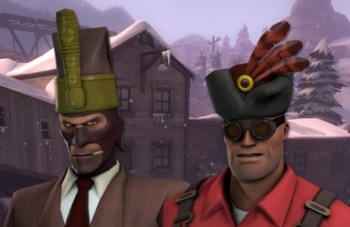 Team Fortress 2's ubiquitous hats are a sticky issue for players. While some see them as simple vanity items to be traded away for new weapons or materials, others pursue them with an almost Ahab-like furor, trading weapons, materials, actual money and even games purchased on Steam for some of the rarer variants. Valve has just made that last part a lot easier. The new trading system is currently in Beta, and can be downloaded via the settings menu in your Steam client. Once installed, it will allow you to trade TF2 items or Steam Gifts, games you've bought or received but have not accepted yet, with other players. Valve stresses in its FAQ that the new system does not allow players to trade used games. Right now TF2, which went free-to-play earlier in the year, is the only game that supports the trading system but apparently Portal 2 will be getting the same treatment "reasonably soon." Valve is also planning to add several third-party games to the system over the next few months. Like the recently announced auction house for Diablo 3, which allows players to trade actual money with other players for in game items, this update really only facilitates something players were doing anyway, and reduces the chances of them getting scammed, or shivved in an alleyway over some kind of cash-for-trilby deal gone terribly wrong. While the idea of trading a game, even one that's a duplicate of a title you already own, for virtual items may seem like madness to some, I think it's a great idea! Coincidentally, I have 23 crates and a Ghastly Gibus I'm willing to trade for a copy of Deus Ex: Human Revolution. Any takers?